Sew It Together 2012 is only a week and a bit away so there's no time to S.I.T. still. I have to admit I'm not just looking forward to the workshops and stitching sessions - I'm looking forward to the loot as well. 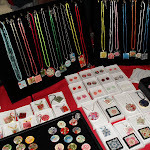 There will be prizes and goody bags and too-tempting market stalls. Can you imagine what it's going to be like with sponsors like Saffron Craig, The Red Thread, Suzy Hausfrau and others (including me!) - way way better than the Cadbury easter showbag. We'll also be swapping stuff with other SITters. 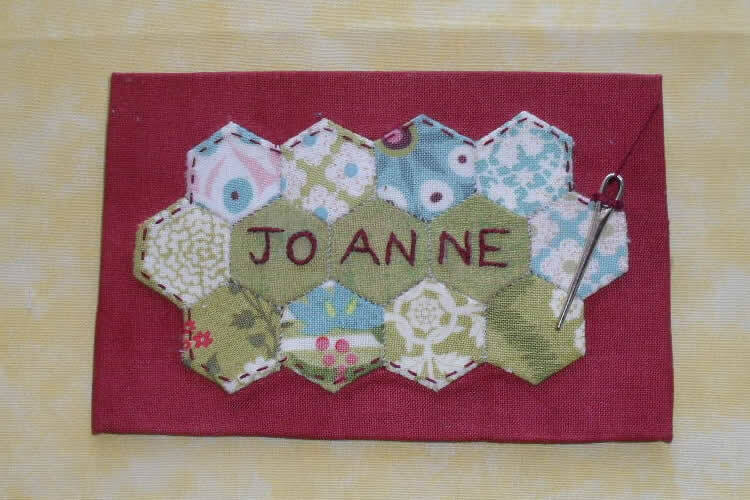 I was too late to join in on the Name Badge Swap so I made one for myself from half-inch hexies. Which reminds me ... check out an amazing work-in-progress on Grit's blog. 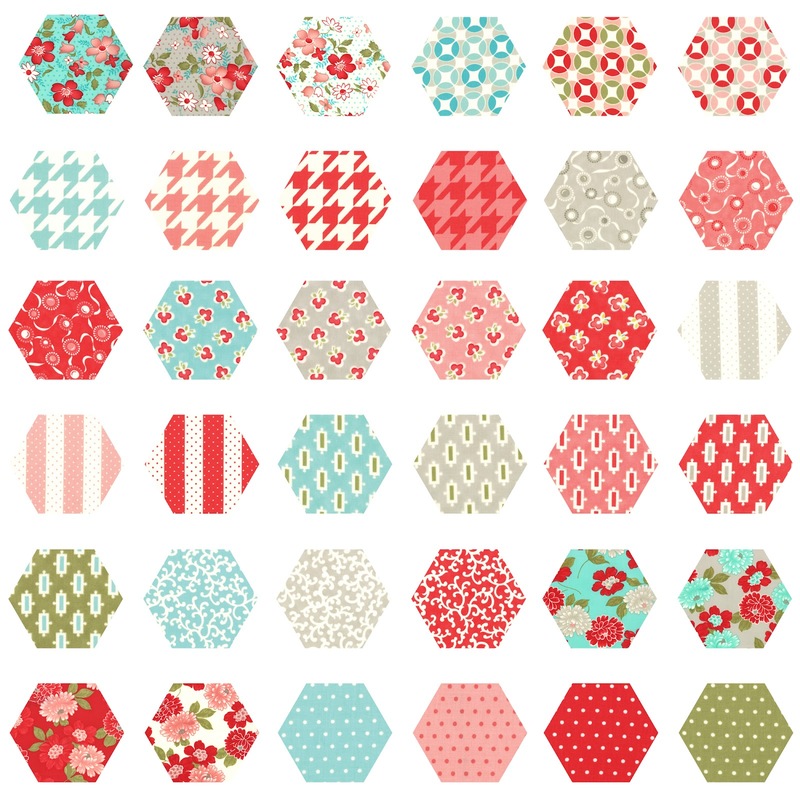 The neatest half-inch hexies you'll ever see. 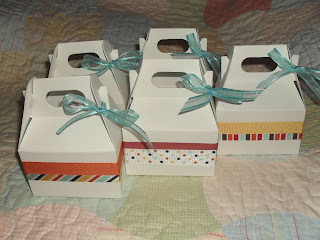 I've just finished making my 5 items for the Sample Swap. 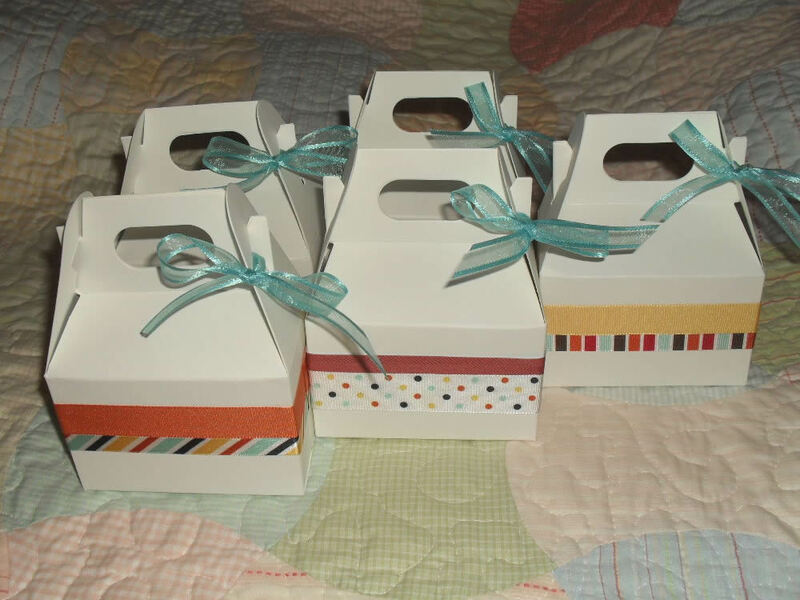 I don't want to spoil the surprise so you don't get to see inside the boxes, sorry! At the S.I.T. weekend, my main project will be my Rose Star Quilt Version 2. 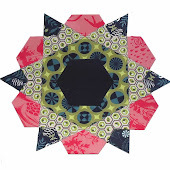 I started the Rose Star earlier this year but the fabrics turned out to be too bold and strong for my taste. 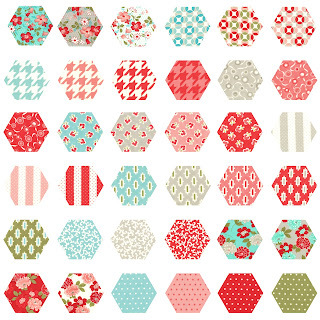 So I have restarted it in a different fabric range. I couldn't wait to get started so here's the block I made last weekend. 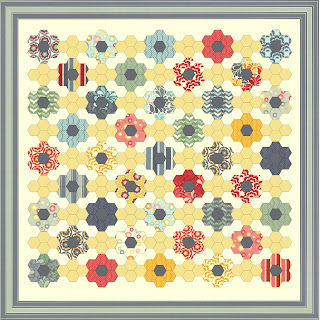 I'm using the Flora range by Lauren and Jessie Jung for Moda and I already know that I am going to love love love it. 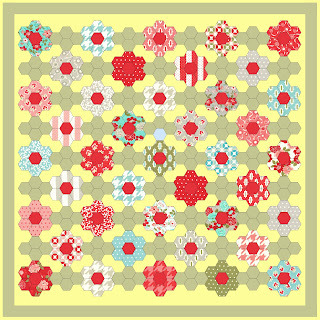 I'm planning to use a very sunny yellow for the background and a strawberry red for the centres, but I'll wait until I've done a few more blocks before deciding. 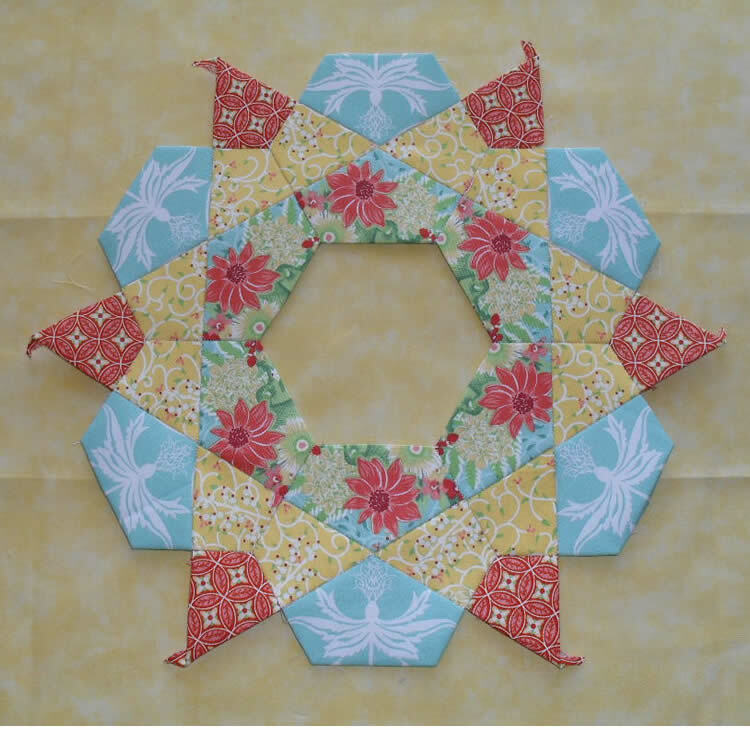 It's going to be such a cheery quilt and a cheery weekend. Only 10 sleeps to go ... starting now! Nighty-night. Perfectionism is responsible for too many abandoned projects hiding in my cupboard. My goal with this one was to have a go and get it done. I did the best that I could each step of the way and just kept moving forward instead of unpicking and restitching. It's just a matter of practice, isn't it. I've got a bit of a stockpile of because I've been meaning to make more stock for my little shop. 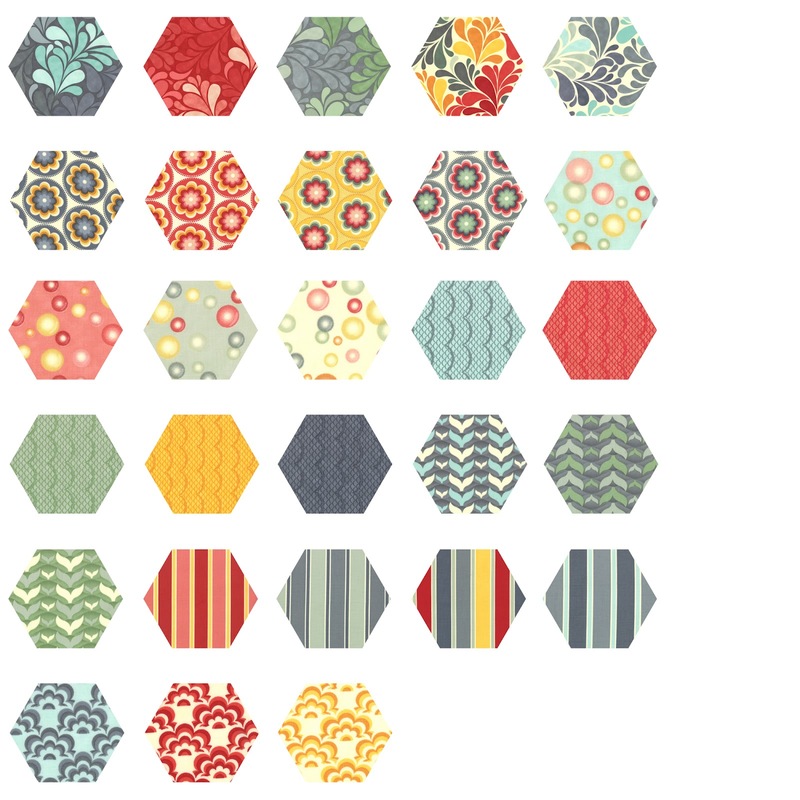 So today I got started by die-cutting some Hexagon Multi Packs in the fresh-as-spring Vintage Modern by Bonnie and Camille. And here's the warm-and-sunny Salt Air by Cosmo Cricket. I was going to die-cut lots more of Moda's new releases - including Oh Deer by Moma and Tradewinds by Lily Ashbury - but I thought I'd just have to see what Vintage Modern might look like as a hexie quilt. And I did a buttercup-yellow version to. Which do you prefer? 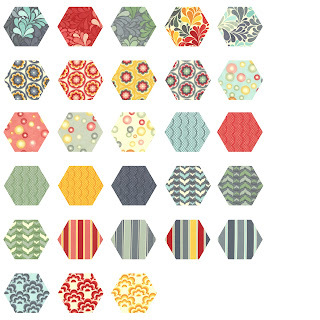 The Hexagon Multi Packs have 42 hexagon flowers in each pack and this layout uses 41. I'll also die-cut some charm packs in the larger size. 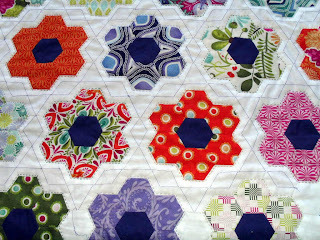 I'll list them in my shop tomorrow but for now it's back to finishing my Terrain quilt. I spoke too soon. I thought I had nearly finished this quilt. 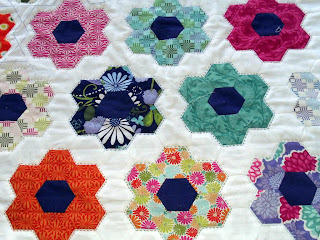 I just had to finish quilting around half-a-dozen flowers, put the border on and voila. I finished the flowers but it just didn't look complete. 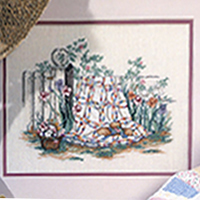 Maybe I stitched too close to the flowers? Maybe I should have used a dark purple all over to match the borders, instead of using coordinating colours to match the flowers? Maybe I needed some more hand-quilting to fill in the white spaces a bit? I tried out one idea - a large hexagon around each flower - but luckily I had the good sense to baste it first in large temporary stitches instead of actually quilting it, because it turned out that I really did not like the honeycomb design. Here is the next idea I tried out. Again, just in large temporary stitches. I liked it! So far I have filled in the white bits around five flowers, using a mid-purple thread. I wasn't sure about the design when I started, but the more I do the better it looks. I think you may be a little bored looking at this project by now, so I promise you that the next photo I show will be of the completed quilt. Nearly finished. What to do next? My Terrain hexagon-flower quilt is almost almost finished and I'm already thinking about what project to move on to next. I've already resolved that I'm not going to start any new crafts this year, so that narrows it down to finishing off a UFO. I feel like doing something a little different, maybe some needlework. I know I have a couple of half-done cross-stitches in my cupboard somewhere. 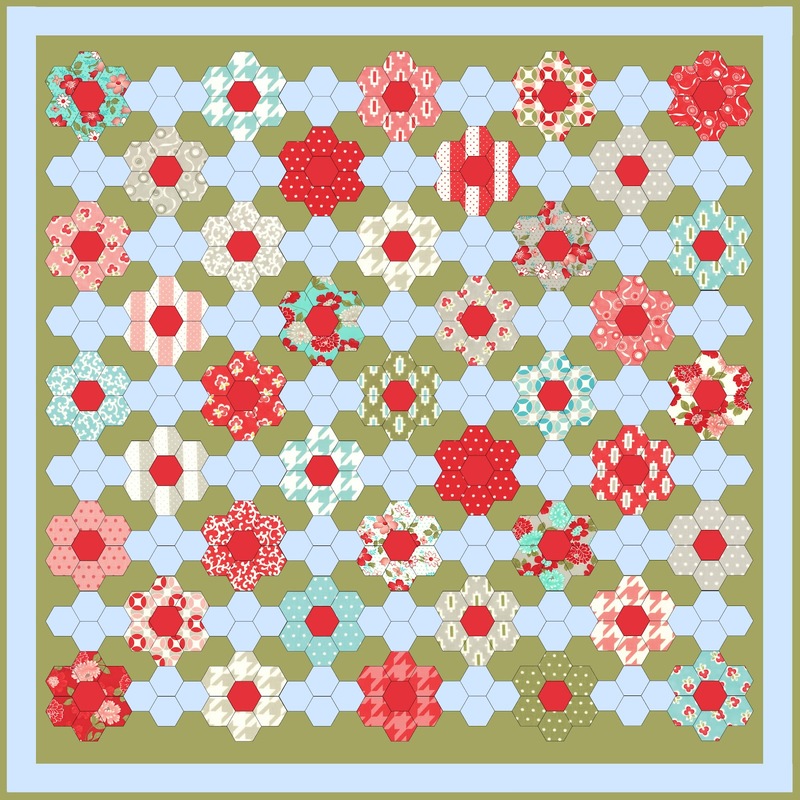 I don't think anyone will be surprised to learn the subject of my favourite cross-stitch patterns ... it's patchwork quilts! 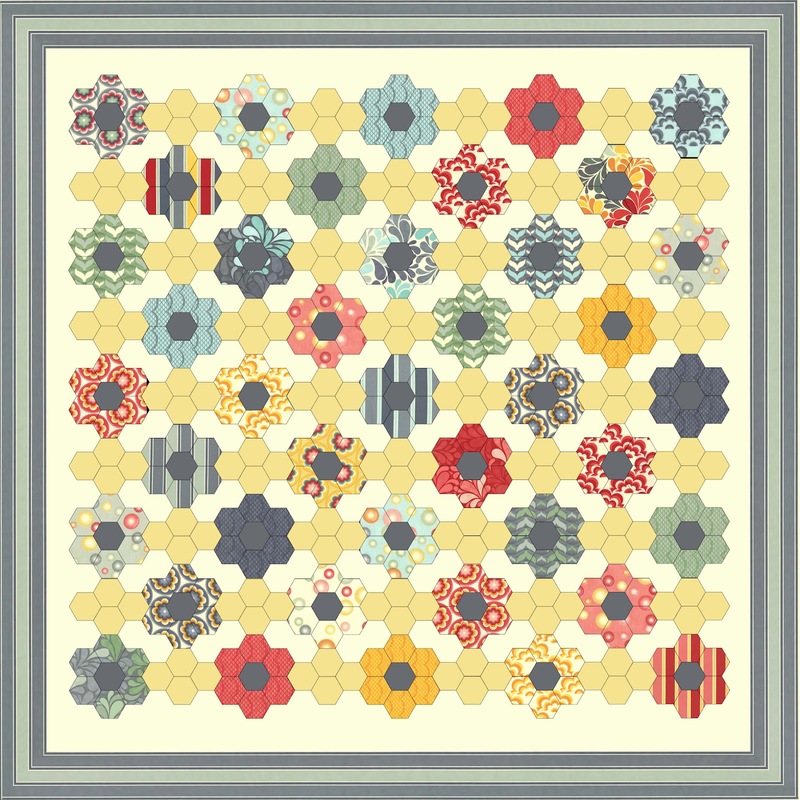 Yes, needlework inspired by patchwork! 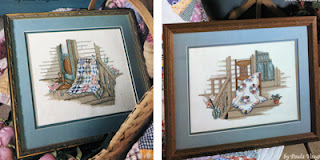 I first came across these beautiful patterns by artist Paula Vaughan in the mid-1990s. 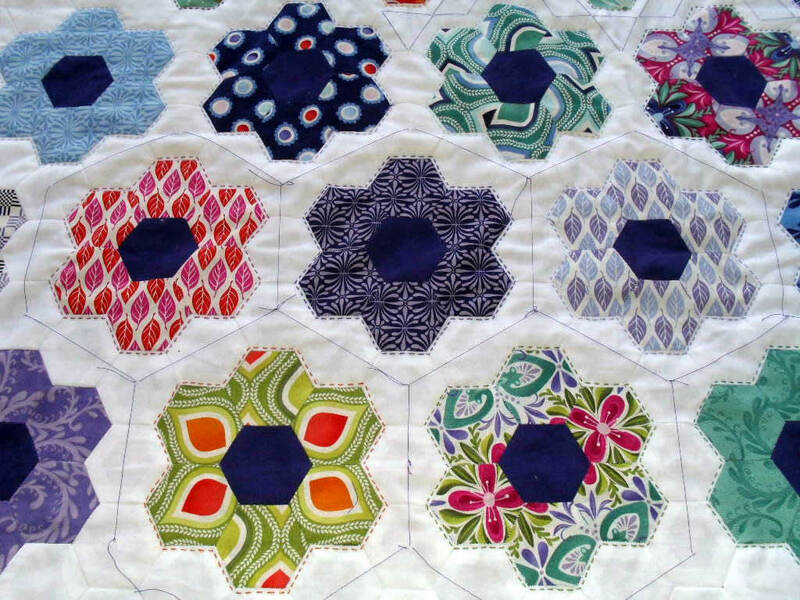 Traditional style quilts thrown over vintage chairs, vases overflowing with armfuls of wildflowers, and the loveliest dresses from a bygone age. 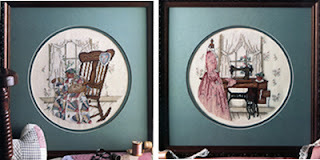 I know I completed these two - looks like a Nine Patch and a Dresden - but I suspect they ended up as gifts for friends. I think this might be another one that I started - a cross-stitch of a Double Wedding Ring. I love it! 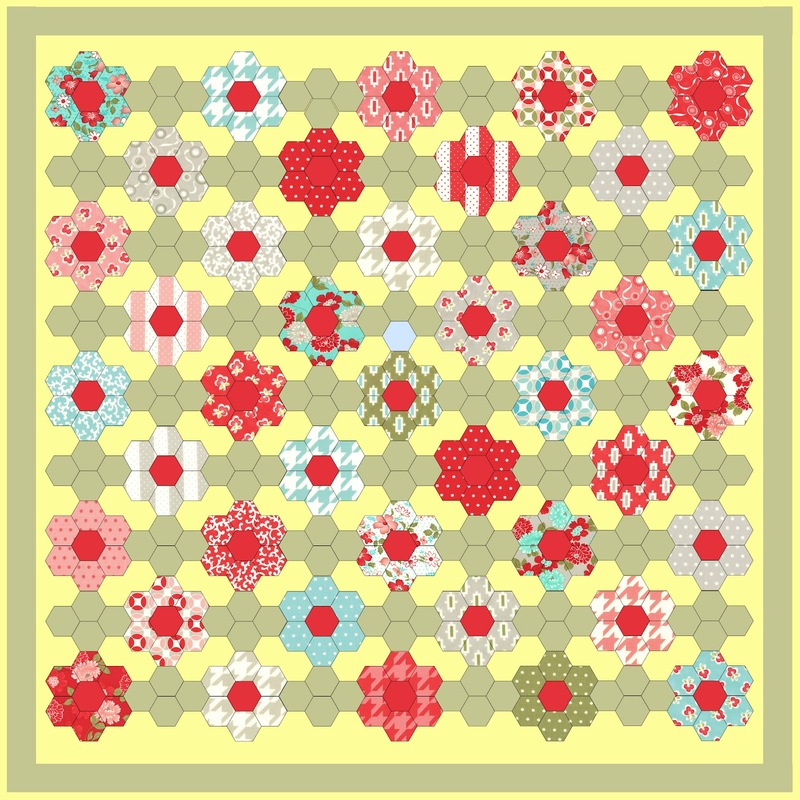 You can see more of Paula Vaughan's patterns here and some can be downloaded from here. I know this is not all of them as I recall once buying her book with a themed quilt for every month and season and they are not all shown here. Bye for now. I'm off to rummage through my cupboards to see what I find.